"I want a puppy (or kitty/pony)"
Whatever variation that will eventually come out of my daughter's mouth, those four words are among the most dreaded fatherhood milestones. It's also personal, because I wanted a dog growing up – as did my father – but my mother didn't. Mom won. I don't want my daughter her to feel like I'm denying her, but I also definitely don't need to add the list of more things I have to deal with on a daily basis. Because while I love my wife, I know taking care of a pet won't be something she really wants to do either. So how do I make it so this turns into a positive father and daughter thing, rather than a "Dad does everything" nightmare? The worst thing to do is to jump right into a dog irresponsibly. Dogs need need to be walked, groomed, given attention… and then there's the poop. On the other hand, fish are a great starter pet. Yes, you need to work out a feeding schedule, and find time to clean the tank every once in a while, but fish don't really need a whole lot of maintenance. Plus, once you get past the startup costs, the actual fish – assuming you're not going for crazy rare varieties – are cheap. As such, the cost of flushing away a mistake isn't so bad. The next steps after that are hamsters/turtles, etc. Once my daughter has mastered the art of hamster care, maybe she is ready for a dog after all (if she still wants it, that is). As the pet gets more complex – and my daughter gets more mature – so does the list of chores that goes with it. By the time she's 10, she should be able to manage most pet care steps without much fatherly help. Before we make that fateful trip to the pound, however, I'm going to give her a chance to pet-sit the real thing. One of our close friends has a bulldog, and I think the final test will be some pet sitting with him. I know bulldogs aren't usually listed as kid-friendly, but she's familiar enough with him already. The important thing is to make sure the pet you're sitting for is good with kids before you attempt it. Letting her learn how to walk with the dog, getting up with it on the weekends to go to the bathroom, and picking up all the toys will let her understand how much work having a dog is – before she jumps into it for real. In the end, whenever you are thinking about bringing a pet into your life, make sure you're able to care for it in the long-term – physically, emotionally and financially. The ASPCA says 5 to 7 million pets end up in shelters every year, and most of them are euthanized. Taking responsibility for a pet is a big deal, and if your kids don't live up to their responsibilities, you need to be prepared to pick up the slack. What do you think? 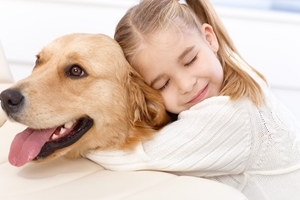 Any more tips to help kids take responsibility for pets?